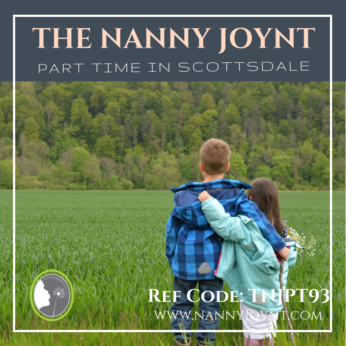 The Nanny Joynt is excited to share a fabulous position working with an amazing family and their two children. Their son is 3 years old and is outgoing, funny and energetic. Their daughter is 1 year old and is calm, happy and playful. Their daughter does have a cow’s milk allergy. This family would like their new nanny to be flexible, outgoing, and enjoy healthy cooking. Flexibility is very important to this family as the Dad is in the military and will be away on deployment. The schedule will be 15 – 20 hours a week with guaranteed hours. Hours will be M-F 5:00pm until 8:00pm. The nanny should be flexible with the schedule as there will be some days that will be 4:00pm until 8:00pm. They would love if their nanny is available on Saturdays from 9:00am until 11:00am (this is optional). This position is offering $15 per hour with paid holidays and guaranteed hours. This family is looking for a nanny who is experienced and loves what they do. Someone who is fun, easy going and is willing to help out where needed. They would like someone who is open and easy to communicate with and is also self motivated, proactive, punctual and very loving with their children. They lead a healthy lifestyle and would love for their nanny to enjoy cooking healthy meals. Bilingual in Spanish would be ideal but not required. The family does have a 10 year old poodle mix who weighs about 18 lbs. Nanny should be a dog lover and willing to help out with pet care: Feeding, watering, letting in and out as needed. They are seeking a nanny who can be with them for the next 10 months or so while Dad is deployed. This is a military family who is away from their own family. Mom is super sweet and easy to talk to and very appreciative of the extra help. They open their arms to those who come in contact with their family. This is a fun family who has a relaxed home and great environment! This is a new adventure for them and they are excited to meet their new nanny.